The VET Veterinary Oximeter is an universal tool with unmatched versatility and cost-eefectiveness for veterinary monitoring and research applications, with proven accuracy for pulse rate up to 450 beats per minute. 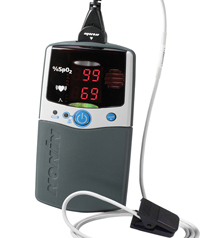 The VET Pulse Oximter has an audible pulse indicator and large LED displays that are visible in low-light situations. Download the PDF borchure here! 2000SL Clip-on Sensor for tonque applications, paw pads, and well-vascularized areas. 2000T For placement on the underside base of the tail or other well-vascularized surfaces. 2000SA Wrap sensor for placement on the toe (large animal) or base of the tail or foot (small animal).